This product trade by using matrix pattern. It provide many many trade each day. Please be reminded that if you use this product, you are dealing with a high risk. A small trading volume will become high risk when high number of trade. So you must carefully set its parameter as well as find a suitable trade server that can give suitable environment to meet trade parameter. It can start trade in a small size of fund as lease as $50. Once it works, there is nothing can stop it's growth. Product control a cost and profit by using slippage and spread. It will not trade during the market is not in an efficiency in both a new order or stop-lost activity. It control a risk with a balancing order system. That mean buy and sell combine is mostly hedge. This make the trading could withstand strong movement of market. So it is become a pure pattern trading system. 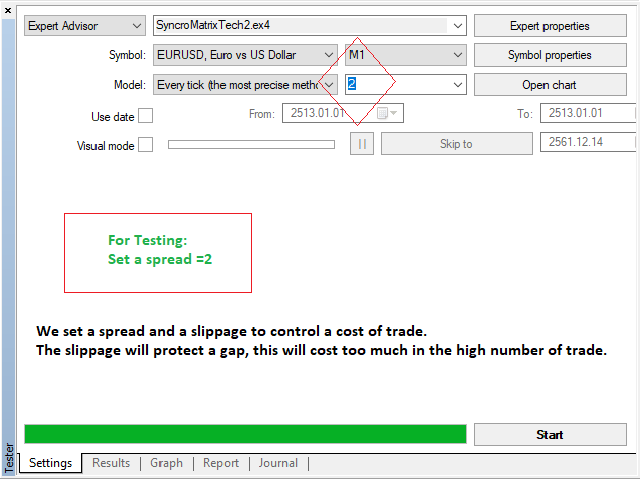 Be-careful 2+1 importance parameters specification, spread and slippage plus take-profit level. If there is a commission we need bring into the calculation. 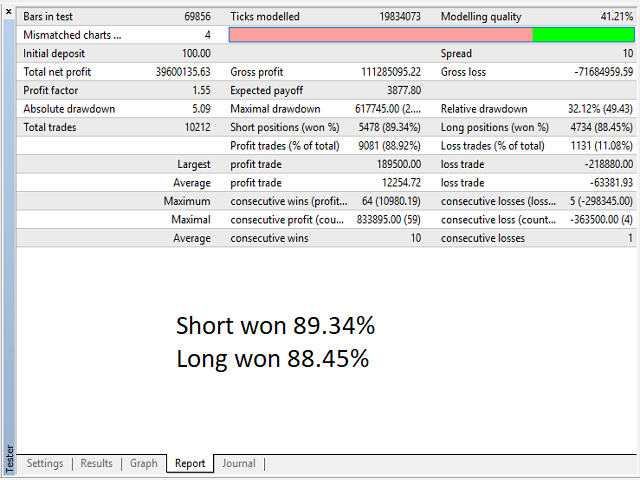 If set take-profit 30 pip, spread and slippage combine should lass-than a half of take-profit level for example. Small take-profit level has more trade than the bigger take-profit level. It means that you have to find a small spread trade-sever for trade. IT IS CHALLENGE YOUR TALENT. The concept of product is a tick pattern mining. It correct a tick every time into 12 bits binary address. Each address has point into a single array. Time by time the density in each array is changed. With using the statistic, then it calculating trading signal as well as exiting signal. There are no complex of calculation but many repeat routine of simple calculation instead. The EA also has option to download the instant pattern from web-site via web-request. Each instant pattern is a hard mining of each parameter set. This is an free of charge forever for trader. How ever without the instant pattern, the testing result is not much different but more time require for startup. It is here, get it and research your the necessary environment. Kick off it now. InpRequireFrequency= 80 > the value is a minimum frequency that require for trading signal. InpPercentFrequency= 10 > this value to help for long trading, the frequency filter will increase in percent of maximum value. 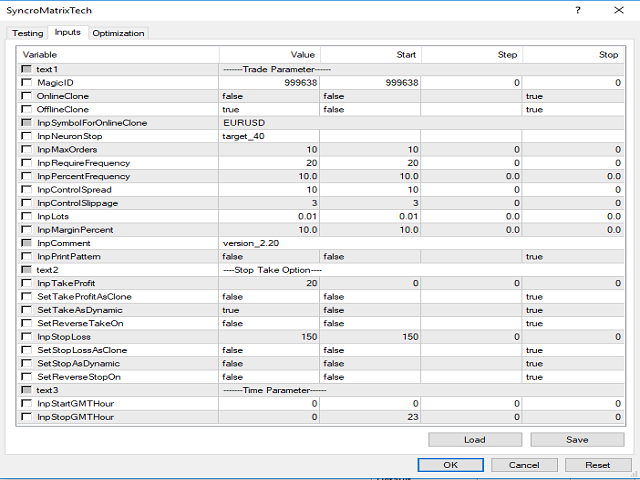 InpControlSpread= 10 > this value to set a value of spread that the robot will trade, if actual spread is more than this value robot will idle. InpControlSlippage= 3 > this value to set a slippage to virtual stop and to new order of the robot, this a way to protect big gap in the trade. InpPrintPattern=false > this value to enable the monitor logs of the robot. Советник работает на реальном счету и потихоньку сливает. Не советую этот советник брать в аренду! New Stop and Take option to match any market condition and pairs. Improving the array files routine let it keep saving daily.. Improve the Input parameters to more flexible for various pairs and robot control.